I love glitters, I really do. Of course taking them off is a whole other issue. My husband bought me this one for my birthday a few weeks ago and I'm just now getting around to swatching them. Today I have a polish from LA Splash called Sparkling Oceanspray which came from Ulta. The color is absolutely gorgeous. It's that teal blue/green color that you can see on the coasts of beautiful beaches, but not in the open ocean. 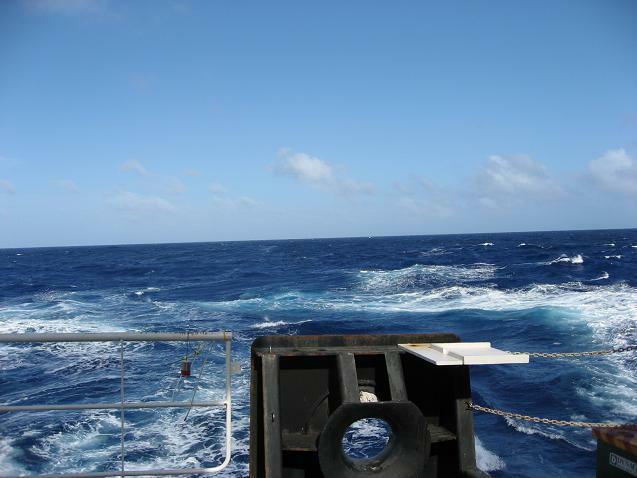 Since I study marine microbiology, I am lucky enough to get the chance to go out on research expeditions out in the middle of the oceans. Some of the clearest of waters are not these types of blues, but more of a deep blue color. But I digress. While I love the bling and color, the opaqueness is really lacking. The picture shows 4 coats and there is a lot of VNL, but this can be dealt with by layering it with another teal polish. Overall, this is a good layering polish. 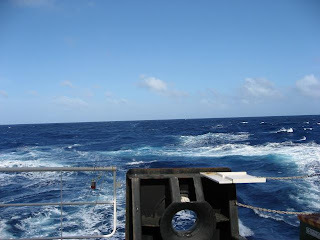 And just to show you the open ocean I am talking about, here is a picture in the middle of the Pacific Ocean between Hawaii and Australia.